The main difference between cloud service and app service is that it is easier and faster to deploy applications in app service than in cloud service. Microsoft Azure is a cloud computing service of Microsoft. It helps to build, test, deploy and manage applications and services through a global network of Microsoft managed data centers. Cloud service and App service are two services of Azure. They both support various platforms and multi-tier architecture, provide access to service bus, storage, etc. In brief, app service deployment is faster than cloud service. Cloud service of Azure allows deploying highly available, massively scalable applications and APIs. It allows developing, packaging and deploying powerful applications and services to the cloud. It also provides load balancing and health monitoring after deploying the application. The health metric dashboard displays the key statistics. The real-time alerts notify about the service availability or other metric degrade. It is possible to deploy applications using languages such as .NET, Java, Node.js, PHP, Python, and Ruby. The developer does not need to worry about faulty hardware and network issues since Cloud service keeps the application available during failures and redirects the traffic from troubled instances to ones that are running smoothly. The automatic operating system updates help to keep the application always highly secure. Cloud service provides a staging environment for testing a new release. It does not affect the existing release. When deploying the new release to production, it swaps the staging environment into production. Moreover, the free auto-scaling helps to avoid unexpected traffic spikes and to automatically perform scaling. Azure app service was previously known as Azure websites. It supports various programming languages such as .NET, Java, Node js, PHP, Python, etc. The applications can be run on windows platform. There is also an App service on Linux for Linux based environments. Azure runs app services on a fully managed dedicated or shared mode virtual machines. There are four types of App Services. They are the web app, API app, Logic App and Mobile app. API App – Used for hosting the RESTful APIs. App Service provides security, load balancing, automated management, and auto-scaling. It is also possible to perform continuous deployment, package management, etc. Cloud Service and App Service provide multiple deployment environments for production and staging. They have automatic OS update management. Both provide access to services such as service bus, storage, and SQL database. They both support platforms and languages such as .NET, Node JS, PHP, Python etc. Cloud Service and App Service provide remote debugging. Both provide visual studio integration. Both support Azure traffic manager. Cloud service is a service provided by Azure that allows developers to access the underlying virtual machine and manage the application container and deployment automatically. App service is a service provided by Azure that handles application deployment and management. The deployment time of app services is faster than cloud service. This is a main difference between cloud service and app service. Another difference between cloud service and app service is that the App service scales up to a larger machine without redeploys but, there is no scale up to a large machine without redeploying in cloud service. One more difference between cloud service and app service is that there is no ability to define and execute startup tasks in app service while it is possible to execute startup tasks in cloud service. Cloud service and app service are two types of services provided by Microsoft Azure. 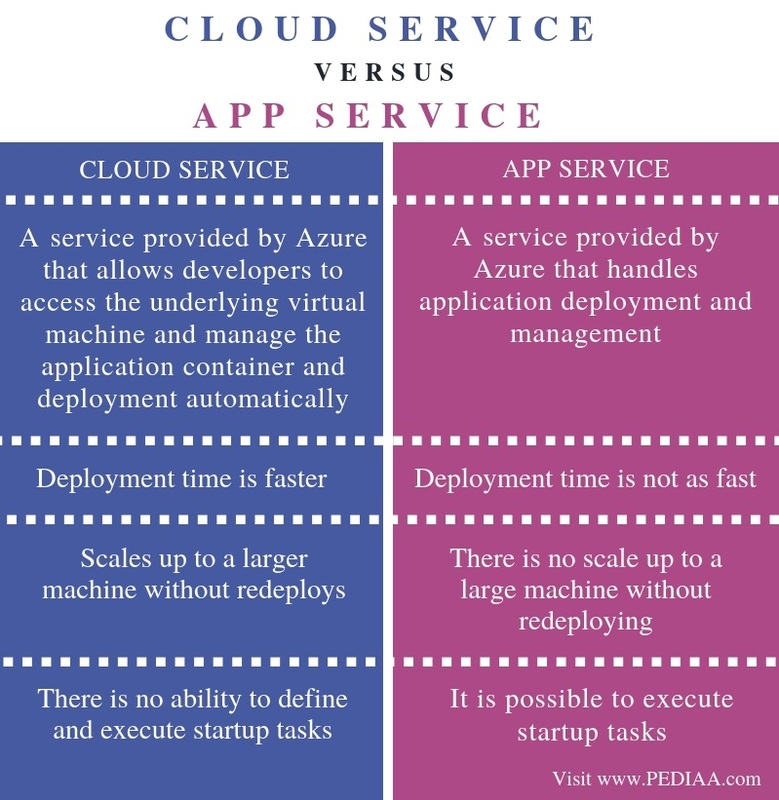 The difference between cloud service and app service is that it is easier and faster to deploy applications in app service than in cloud service. 1. “Cloud Services – Deploy Web Apps & APIs | Microsoft Azure.” Service Level Agreements Summary | Microsoft Azure, Available here. 2. “Azure App Service – App Hosting | Microsoft Azure.” Service Level Agreements Summary | Microsoft Azure, Available here. 3. . “Azure App Service, Virtual Machines, Service Fabric, and Cloud Services Comparison.” Microsoft Docs, Available here. 4. Badola, Vineet. “Microsoft Azure App Service, Cloud Services, or VMs?” Cloud Academy Blog, Cloud Academy, 27 Aug. 2018, Available here.